Viet Nam War Games presents a cluster of columnar ceramic, clay, and metal objects of various heights and colors. 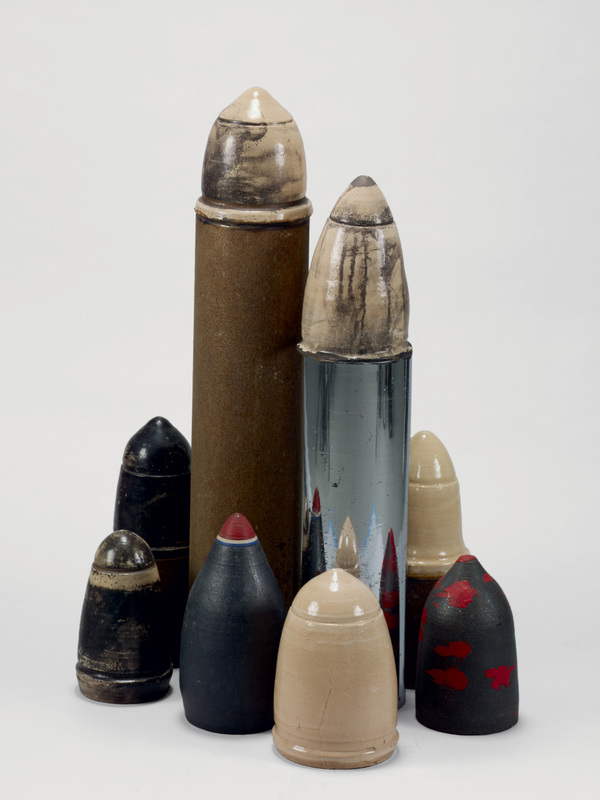 The objects resemble munitions or rockets, and one of them has a blood red smear across the front of it. Created in 1969, at the height of the Vietnam War, this work reflects the frustration and disillusionment with the war that the artist shared with an increasing number of Americans. With the death toll rising, 1969 was a watershed year for the war. The Tet Offensive of the previous year had surprised the American militia, government, and public with the capacity of the communist forces. Although President Lyndon Johnson initially requested a troop increase, public sentiment had turned against the war, and his successor, Richard Nixon, would begin a withdrawal of U.S. forces. "Viet Nam War Games." Now Dig This! Art in Black Los Angeles, 1960–1980 Digital Archive. Los Angeles: Hammer Museum, 2016. https://hammer.ucla.edu/now-dig-this/art/viet-nam-war-games.